This luxury apartment is quite different that the standard fair. The size is vastly larger and most certainly warrants an early inspection to appreciate the quality. 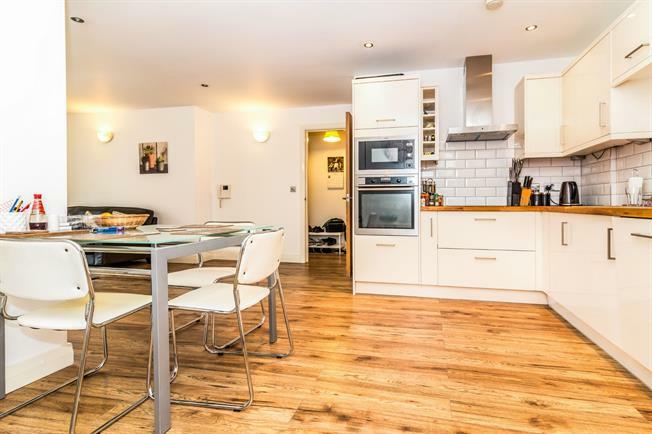 Comprising of a hallway to an impressive extra wide living area incorporating a new gloss fitted kitchen with integrated appliance, with a door to a Juliet balcony. Two superb size bedrooms with the master bedroom featuring an en-suite shower room. The main bathroom is also fitted. Castlefield Locks offer also a concierge service. Wooden front . Radiator, laminate flooring, ceiling light. Double bedroom; double glazed window. Radiator, carpeted flooring, painted plaster ceiling, ceiling light. Double bedroom; double glazed window facing the front. Radiator, carpeted flooring, painted plaster ceiling, ceiling light. Heated towel rail, tiled flooring, painted plaster ceiling, spotlights. Concealed cistern WC, single enclosure shower, wall-mounted sink. UPVC front double glazed door, opening onto a balcony. Double glazed uPVC window facing the front. Radiator, painted plaster ceiling, ceiling light. Roll edge work surface, fitted and wall and base units, stainless steel sink and with mixer tap, integrated, electric oven, integrated, electric hob, stainless steel extractor, integrated standard dishwasher, integrated fridge/freezer.